Wherever hygiene plays an important role, surfaces must be regularly cleaned and disinfected. Only in this way can a high hygiene standard be achieved and maintained. Our electrochemically generated disinfectant ActiWa® is ideally suited for the disinfection of these surfaces. The disinfecting effect is excellent even at a low active substance concentration. Thanks to a very dilute ActiWa® solution, pipelines and tanks can be disinfected very well after the cleaning process. Normally, an active compound concentration of only 7-10 mg / liter is sufficient. By way of comparison: disinfection by means of peracetic acid is normally carried out with a concentration of 1% - this corresponds to 10'000 mg / liter. 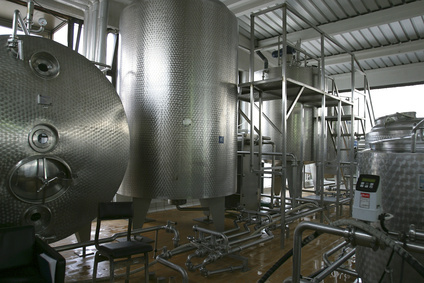 The systems are then rinsed with drinking water to which a small amount of ActiWa® has been added for disinfection. In the processing of food, the highest hygienic standards are a must. Central foam cleaning systems are often used for regular cleaning. A central pressure boost pump delivers the necessary water pressure. A pressure line distributes the water to various satellites, where the detergents and disinfecting agents are finally added. The rooms and machines are foamed, disinfected and rinsed via a hose and a spray lance. 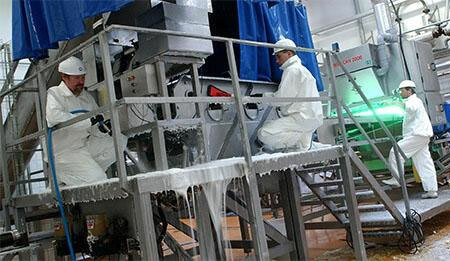 It goes without saying that the water in the foam cleaning plant has to be microbiologically unpolluted. Unfortunately, this is not the case in practice. Biofilm forms in the lines, which then microbiologically contaminates the water. This can be prevented by adding the smallest quantities of ActiWa® - the water remains drinking water - before the pressure boosting pump. Biofilm therefore has no chance and the rinsing water remains microbiologically clean. ActiWa® can, of course, also be added as a disinfectant for the satellites.